The trio’s first rehearsals mostly picked up from the Nice’s and King Crimson’s repertoires, including such well-known numbers as “Rondo” and “21st Century Schizoid Man.” In August of 1970, even as they were working on the songs that would ultimately comprise their first album, ELP played its first show at the Plymouth Guildhall, just ahead of the Isle of Wight Festival in August of 1970. The group’s self-titled debut album was finished the following month and released in November; an instant success, it rose to the Top Five in England and the Top 20 in America. The single “Lucky Man” also was a hit, and their stage act rapidly became the stuff of legend. The recording of the second ELP album, 1971′s Tarkus, tested their cohesiveness while stretching their sound in new directions. Emerson was interested in further exploiting the range of the Moog synthesizer, and had conceived of an extended suite built around an opening eruption of sound, while Palmer had come up with an unusual drum pattern that he was eager to use. When they tried to present their ideas to Lake, who had assumed the mantle of producer with the first album, however, he couldn’t really grasp the piece. He balked, and arguments ensued, and for a time it looked as though there might be no second album. The group eventually agreed to disagree about the proposed track: “Tarkus” became the title of the new album, and ultimately defined the ELP sound as most people understood it — the song was loud and bombastic, somewhat gloomy in its lyrical tone, and exultant in its instrumental power. A descendant of “The Three Fates” and “Tank” from the first album, “Tarkus” was a much denser piece of music, featuring not only multiple overdubs of instruments but textures that ultimately proved very difficult to re-create on-stage. After Tarkus hit the number one spot on the English charts and reached the Top Ten in America, their March 21, 1971, concert at Newcastle City Hall — featuring the group’s adaptation of Mussorgsky’s “Pictures at an Exhibition” — was recorded for release, and became another major hit. It was eight months before ELP’s next record, Trilogy, was released in July of 1972. In the interim, they toured extensively, and made it their business to cultivate the college audience that took most naturally to their work. With Trilogy, the partnership was back fully in balance, with each member taking an equal share of musical responsibility. Moreover, Lake never sang better, nor did the group ever sound more comfortable and laid-back; among the eight very solid numbers in a classical-rock vein, there was tucked a track that became virtually the band’s signature tune, a version of Aaron Copland’s Hoedown. Such was the group’s credibility that when it came time to record a version of the first movement of Alberto Ginastera’s Piano Concerto No. 1 and the publisher denied them permission, they approached the composer himself, who fully approved and applauded the track that became “Tocatta” on Brain Salad Surgery, released in 1973 on their own record label, Manticore (named for one of the mythological creatures portrayed in “Tarkus”). 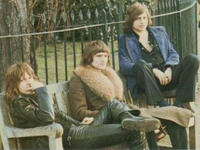 Through Manticore, ELP also released material by Pete Sinfield and the Italian progressive rock band PFM; Sinfield’s presence as a composer with Lake on Brain Salad Surgery helped strengthen one of the group’s lingering weaknesses, its lyrics — where Lake’s use of language had always tended toward the pleasant but simplistic, Sinfield, a veteran of King Crimson, provided lyrical complexity nearly as daunting as the best of the group’s music. The record fared poorly, and the group was never the same: Works destroyed ELP’s unity, and their main motivation for recording seemed only to be their contractual obligations. Worse still, they’d squandered valuable time with work on the double album, time during which the public’s taste was changing — the progressive bands were coming in for special criticism, and the notion of extended suites, conceptual rock albums, and classical-rock fusion now seemed hopelessly ponderous and pretentious as the rise of punk rock and disco seemed to undermine any notion of intellectualism in rock. Works, Vol. 2, released in November of 1977, was nothing more than a collection of obscure B-sides and odd tracks dating back four years, while their next album of new material, Love Beach, was later described by the bandmembers themselves as nothing more than a matter of going through the motions.